We have updated PeakTrace Online Pro to use PeakTrace 6.61. The allows users of PeakTrace Online Pro to try the new reltrace basecaller setting as well as experience the improved basecalling and trace processing from this release. If you have not registered before and would like to trial PeakTrace then please visit the PeakTrace Online Pro Registration page to obtain the access password. 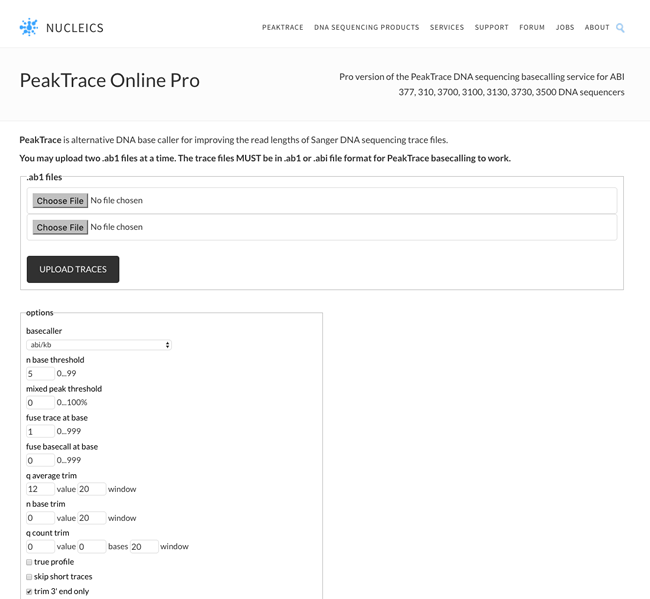 We have released a new version of our free online PeakTrace service – PeakTrace Online Pro. 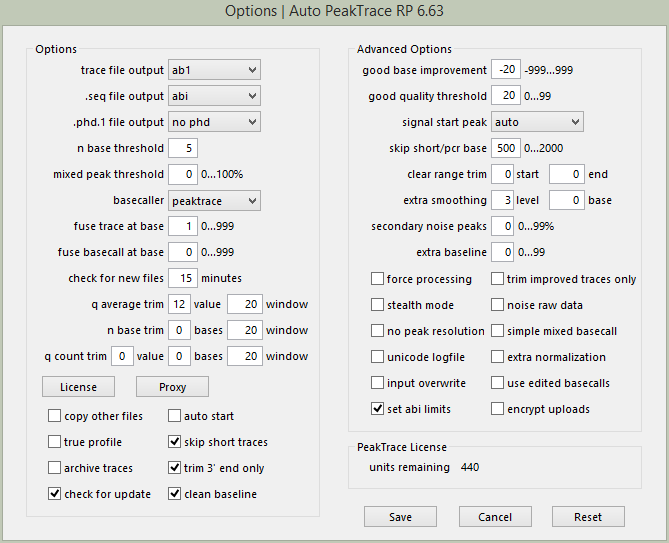 This new version provides access to the full PeakTrace processing settings and better allows users to see what PeakTrace can do. To use PeakTrace Online Pro please register at the PeakTrace Online Pro Registration page. You will be emailed the access password for the PeakTrace Online Pro page. This will allow you to process up to 250 traces per day for the week (the access password is changed every Sunday). You will only be able to register once to use PeakTrace Online Pro so please don’t register until you are ready to start testing PeakTrace on your traces. As part of the release of PeakTrace Online Pro we have retired the old PeakTrace Online service. If you are already familiar with PeakTrace and just want to process your traces we recommend that you purchase some PeakTrace RP units. You can do this via the Buy PeakTrace Units page. We have introduced a new simplified and more flexible pricing model for both the PeakTrace RP and PeakTrace:Box systems. Our old pricing model lacked the flexibility to taylor the PeakTrace volumes to the needs of individual sequencing facilities. By simplifying the pricing model we have been able to lower our prices and provide greater flexibility to our customers. For the RP based systems we have retained the pay-as-you-go model, but we have reduced the prices for the 500, 1000, 2000 and 5000 unit volumes by between 6% and 15% to make them more consistent. We have also replaced the 25,000 unit size with a 20,000 unit size and introduced a new 50,000 unit size. Customers will pay the same (or less) than under the old pricing model. The new pricing for PeakTrace RP. *Assuming 60% of traces are improved by PeakTrace. The PeakTrace:Box pricing model has been made more flexible so that you can now match the scale purchased to your exact volume needs. Under the old model you were limited to fixed sized volumes (i.e. 500, 1000, 2000, 5000, 10,000, or 25,000 traces per month). This meant, for example, if you only needed to basecall 15,000 traces per month you either had to pay for more units than you needed (i.e. 25,000) or renew early. Under the new pricing model we have retained the “discount with volume” model (i.e. each unit is cheaper the more you buy), but you can now buy exactly the number of basecalling units that your facility needs. Each additional unit purchased reduces the overall price per unit. We have also retained the lease time discount (i.e. greater discounts with longer leases). The bottom line is the majority of our customers will save, but to ensure no customer pays more, all existing PeakTrace:Box customers can choose to remain on their current pricing if they wish. Nucleics will be exhibiting at the Association of Biomolecular Resource Facilities 2017 Annual Conference in San Diego from March 25th to 28th. Please drop by and see the Nucleics team at Booth #125 as we would love to chat to you about your research and introduce you to some of our exciting new products we will be releasing this year. We have a new opening for a graduate scientific product specialists to help educate more of the world about our software. If you are love science, international travel and people then check out our new position. All the details and selection criteria are on our Jobs page – Graduate Scientific Product Specialist.